Specially Engraved Portraits of Movie & Radio Stars issued circa 1933 by Lux Toilet Soap. Issued in the United States. 24 pieces listed on envelope. 2 additional seen. Thus total of 26 now known. Each measures 5" X 7 inches. Printed on light card stock. Black and white photos with green tone framed in green with white surrounding and extending to edges. 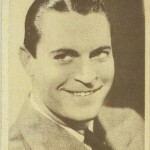 Lux also issued a similar set of 9" X 12" portraits in 1934. That set is featured on THIS page. See complete text checklist below the gallery. Checklist also pictured on manufacturer's envelope below (image courtesy Amit Benyovits). Envelope that 1933 Lux set was distributed in. Image courtesy Amit Benyovits. All shown except Wallace Beery, Joan Crawford, Jean Harlow and Ben Lyon. Text listing of contents follows below. * Denotes stars pictured in gallery but unaccounted for on Lux Envelope.